Recently we received a bundle of goodies courtesy of TriplePoint and the Pokémon Company International. Today we get to take a look at even more Pokémon trading cards. Two items hail from the Mythical Pokémon Collection set which is part of the Pokémon 20th anniversary celebration. The rest of our haul comes from the recently released Steam Siege series. 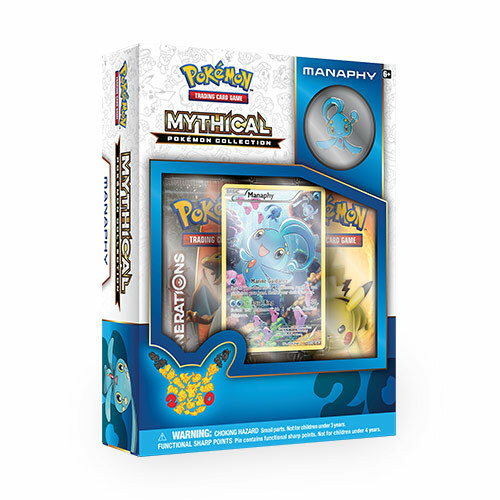 Our first package contains Manaphy, the Seafaring Pokémon, who was the month of June’s legendary. At first glance, the overall design is appealing. The blue banners reflect Manaphy’s coloring and typing which makes it very fitting. It is a small detail which goes a long way since it helps highlight the contents within. It comes with an adorable pin featuring Manaphy in a generic pose which helps fans recognize it in an instant. 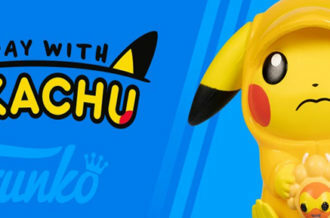 The card on display features a more unique image of the Pokémon in a fully printed card featuring Luvdisc and Phione in the background. Using it in battle may be a risk. With only 70 HP it won’t really stand much of a chance if it’s coming fresh off the bench. Marine Guidance allows you to add more Water-types to your hand so make sure to stock up on some. Aqua Ring could help out in a jam since it inflicts damage and lets you switch Manaphy for a teammate waiting to jump in. Hopefully the included Evolutions booster packs will add more to the deck. We also received August’s legendary Pokémon, Arceus. The Alpha Pokémon is widely known to have created the Sinnoh region and possibly the creatures found there. 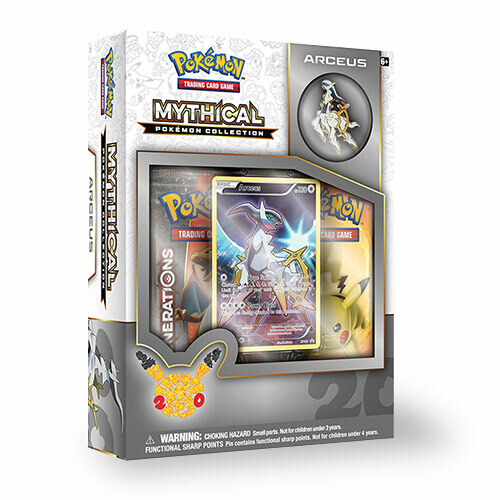 Similar to Manaphy, the Arceus packaging is simple yet effective. It clearly shows off everything you receive. Unfortunately for Arceus’ Normal-type, the box is a bit bland. But that’s fine because its name and legacy speaks volumes. 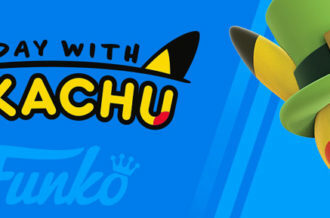 Since it is quite a popular Pokémon, collectors receive a majestic pin featuring golden outlines. The featured trading card offers a striking image of the legend as its frame delivers a bold contrast to a celestial background. Its 130 HP is pretty fair but definitely doesn’t match up with its status. 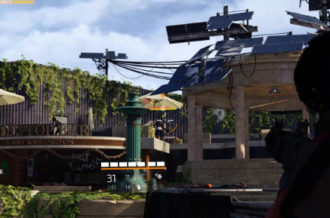 It uses Type Switch allowing players to choose any of ten other types though we are not sure how it plays out with weaknesses and resistances. Power Blast inflicts 120 damage which is a lot more fitting of Arceus. 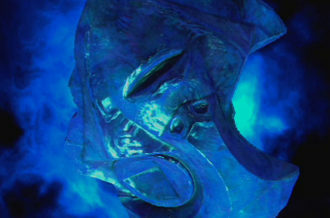 It requires four energies of any type but they must be discarded after attacking. It should make for a great addition to a team as long as you are able to build it back up after every use. Our final trading cards come as the latest in the series– Steam Siege. There are two themed deckboxes in this set. Ring of Lightning features a holographic Hoopa in its Unbound form as the exclusive card. It is very fierce and shows off some quality detail along its body and background. It has pretty high HP with 130 and two pretty impressive attacks. Hyperspace Punch inflicts 20 damage points to any two of your opponent’s Pokémon, even the ones on bench. It only requires one energy card and could probably wipe out the entire side on its own. There is a powerful backup attack in Portal Strike which deals 130 damage but cannot be used during your next turn. The deck has an array of Psychic, Electric, and Normal-type Pokémon. 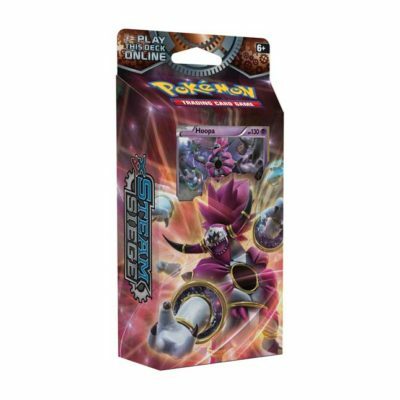 A playmat, damage counters, and shiny Hoopa coin are included along with some other helpful items. Then, we got our hands on the Gears of Fire deck which features various Fire, Steel, and Normal-types. Volcanion makes its TCG debut in this set with a strong stance against a holographic, steamy backdrop. It has 130 HP which is pretty high and seems to be the average for many legends. Power Heater inflicts 20 damage and lets you search your discard pile for Fire-type energies and lets you attach it to two of your benched Pokémon. This will only be helpful if you’ve stacked the deck with enough firepower. Steam Artillery requires three energies and causes an explosive 100 damage points with no additional effects. 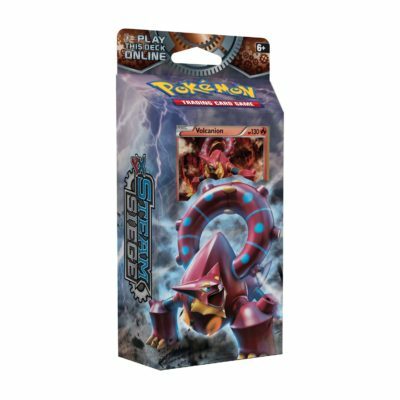 A shiny Volcanion coin is included along with a checklist, deck box, and more. All in all these cards should really heat up matches. New Pokémon and Trainers in each deck will create a variety of strategies for players. 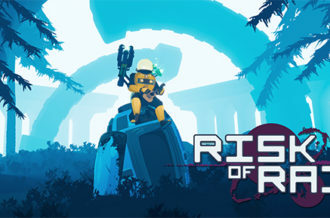 Collectors will also want to get in on the action with such unique additions. These are beautiful cards and worth picking up if you want to keep your team relevant. We still have a long way to go until the upcoming GX cards make their debut, so these will have to hold down the fort until then.